About 3 months ago, I received the entire Tula Probiotic Technology Skincare line as a PR sample. I am so impressed by the line that I have made them a part of my daily skincare routine. I have been wanting to do an in-depth skincare routine post that discusses all my favorite products, but I've been flat out busy with both my boys and I starting school. 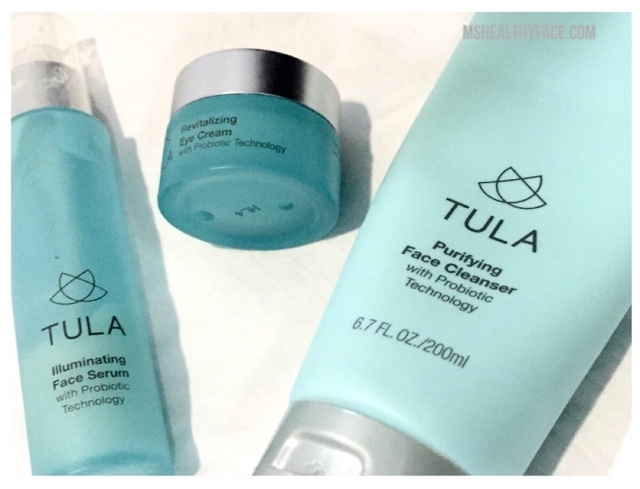 This morning, I found out Dr. Raj, gastroenterologist and the creator of Tula Probiotic, would be live on QVC today talking about Tula, and so I wanted to share my favorite three pieces from the probiotic line that I use daily! My first love is the Illuminating Facial Serum. I love how nourishing and hydrating it is! It is perfect in the morning under makeup because it quickly dries matte, yet gives my skin some radiance. I've used all, but a 1/5 of the bottle! Highly recommended! Next up, the Purifying Facial Cleanser is my, and my husband's, current favorite face wash! Tula is completely unisex from the packaging to the scents, and so, it is a great option if you want a one stop shop for you and your significant other! The face wash is dense, luxurious, and non-drying/stripping. It's thick enough to get off all my stubborn makeup, and definitely a part of daily evening skincare routine. Lastly, the Revitalizing Eye Cream is a must have. I use it morning and night. I won't put on my concealer unless, I put this eye cream on my dehydrated under eyes. This helps prevent my concealer from cracking or looking cakey. I hope this helps! Please let me know if you take advantage of the deals on QVC! Would love to know if you enjoy Tula as much as I do!